Once upon a time, the chances of a business or consumer being fleeced, financially, were smaller than in today’s hi-tech environment. To be sure, bad actors have been plundering, thieving and murdering for centuries. (As an interesting –and historical- aside, an article in the Los Angeles Times details quite the whodunit claiming that a 430,000-year-old skull suggests murder is an ‘ancient human behavior’). But murder is not the bad human behavior to which we are referring today. Globally, an egregiously unwanted byproduct of the Internet of Things is cybercrime. Simply defined as a crime involving a computer and a network, cybercrime takes on many forms… fraud, email phishing, identity theft, piracy, and hacking to name just a few. In the deep web, where users are anonymous, malicious intent is even higher. With millions of interconnected devices worldwide, the escalation of abuse has risen enormously. The accompanying graphic cleverly illustrates the cloud’s unintended role in potential cybercrime exposure. In a 2017 TechRepublic interview with IBM’s executive security advisor Etay Maor, Maor explains the difficulty cybersecurity faces in keeping up with cybercrime, further suggesting that new technology puts companies at even greater risk. Misconduct on the internet can be pervasive across many industries. 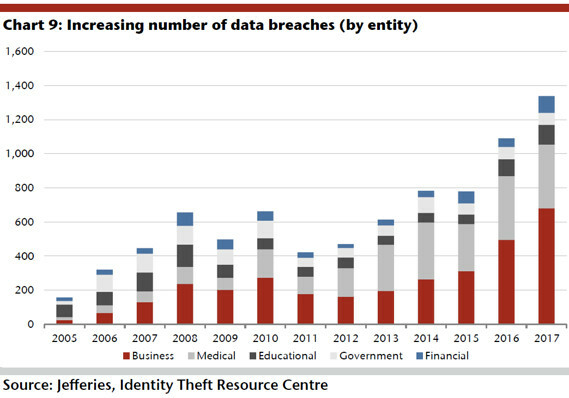 MarketWatch published this chart with alarming information compiled by Jefferies, a global investment firm and the non-profit Identity Theft Resource Center. 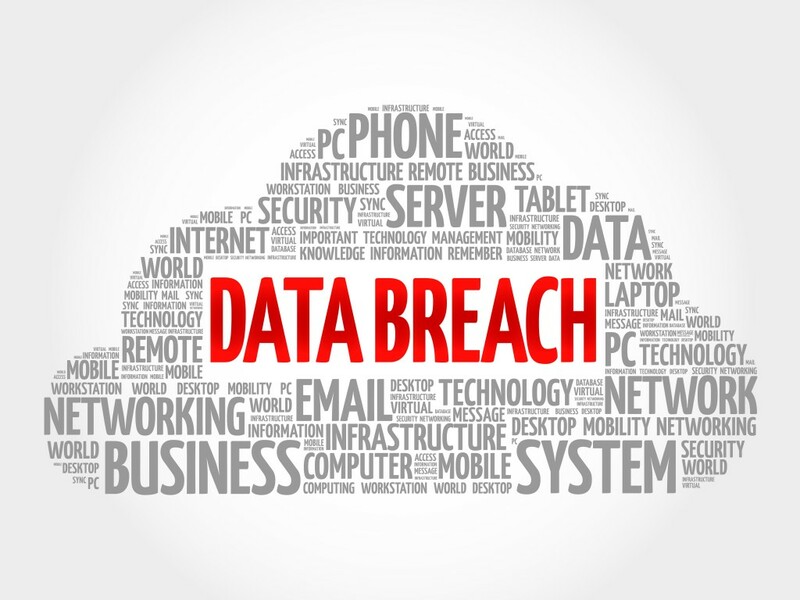 Could data breaches be the foulest of offenses committed against a business? Perhaps. In the 21st century of big data and data analytics an enterprise’s most prized possession just might be their data. Valuable business intelligence is the result of information gleaned from effectively processing data from customers, suppliers, competitors and the global marketplace. Companies are vulnerable not only to data breach, but breaches of trust. Their stock plunged almost twenty percent over the course of 10 days once news broke that data from tens of millions of users ended up in the hands of political consultancy firm, Cambridge Analytica. Many users subsequently deactivated or deleted their Facebook accounts while many corporations companies suspended their advertisements on the social media platform. Although certainly not purposely perpetrated by Facebook CEO Mark Zuckerberg, who has since apologized, this scandal highlights how critical it is for companies to be forthcoming and transparent about the use –or misuse- of data. Not to mention implementing exceptional data protection and security. Small Business Trends posted a brief list of 5 Ways Big Corporations Protect Their Data That Small Businesses Should Copy, here; NASDAQ suggests 5 Ways Small Business Owners Can Protect Data, here; and Forbes outlines key steps in How To Protect Your Business From A Data Breach: Seven Key Steps, here.